I have to admit, the sight of the first leaves falling through that crisp cool autumn air, the smell of cinnamon and apples wafting through my local coffee shop, and the sounds of children rushing off on bicycles to get to school, all fill me with an anticipatory glee of the approaching holiday season. Ah, fall. My favorite time of year, when the joys and gatherings of parties and celebrations are just weeks away. In preparation, I find myself reaching for and digging through dusty boxes of decorations, readying our house to be “spookified”. To inspire you to get into the “spirit” of Halloween, I have featured some phantasmically fantastic portals that will spook the most intrepid of trick or treaters. This door decor takes me back to my childhood with its simple, yet outrageously “monsterous” effect. Find poster paper at any school supply store and have your kids join in to help you. Keeping with the clever and cost-friendly paper cut-out decoration theme, these bats look almost 3-D and oh, so eerie. Add a subtle touch of orange with a natural display of gourds and/or pumpkins. What better reason to paint your front door a “Halloween orange” than to showcase this fashion forward holiday entryway. It’s just paint, after all, and can be carried over to Thanksgiving. Hauntingly tempting. For those of you who have doors with glass inserts, this spooky spider casts a very scary silhouette that will thrill any visitor who dares to approach. Who says you have to go big to “boo”? By creating small black and orange silhouetted bats, cats, spiders, pumpkins and witches, the illusion is frighteningly fun. Creepy crawly stick-on spiders will surely do the trick. For those of you who wish to decorate in a more understated fashion, this wonderfully home-made candy corn wreath is sweet and subtle. 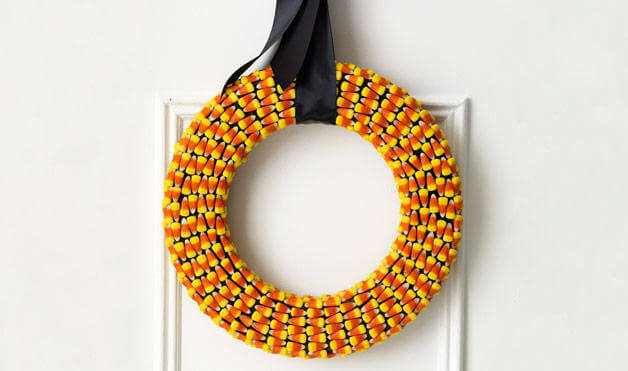 For candy corn wreath how-to instructions click here.